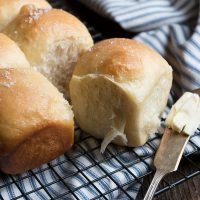 Rich, buttery dinner rolls, best enjoyed warm from the oven! Stir together milk, yeast, and malt syrup in a large bowl or the bowl of a stand mixer fitted with a kneading hook. Let sit until foamy, about 10 minutes. In a medium bowl, whisk together flour and salt. Add to milk mixture along with softened butter and stir with a wooden spoon or mix with mixer until a dough forms. Knead 5-6 minutes, adding additional flour as needed, to produce a smooth, moist dough. Remove to a greased bowl. Cover with plastic wrap and let rise until doubled in size, about 2 - 3 hours. *Trust your eyes here and not the clock. You will want to let the dough rise until it has doubled in size, however long that takes. I find it helpful to rise in an 8-cup glass measuring cup, so it's easy to see when it has doubled. Punch down dough and let rise again until doubled again, about 2 hours (or until doubled in size). Meanwhile, melt a bit of butter and brush on a 9x5-inch loaf pan. Set aside. Remove dough to a floured surface and divide into 8-10 equal sized pieces. Form pieces into balls and place into the buttered 9 x 5-inch loaf pan. (4 or 5 rows of two rolls, spaced evenly in the pan). Cover pan with a clean tea towel and let rise until puffy and about doubled, about 2 hours more. Preheat oven to 350F. When rolls are risen, brush with melted butter and bake in preheated oven for 25-30 minutes, or until golden. Remove from oven. Let stand a minute, then remove from pan to a cooling rack. Brush with more melted butter and sprinkle tops with finishing salt. Remove from pan and serve warm.